Isn't this amazing. 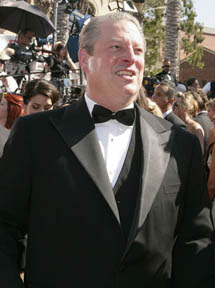 Al Gore lost he presidential election with the narrowest margin 7 years ago, and since then he won an Oscar for best documentary for "Inconvenient Truth", and now an Emmy for Outstanding Creative Achievment in Interactive Television: Current. "Accepting the award for Current, which makes significant use of user-generated content, were partners Joel Hyatt and former Vice President of the United States Al Gore. On a night in which the Television Academy and Fox were touting their efforts to produce the first-ever carbon-neutral Emmys, Gore, who has led a passionate campaign to raise awareness about global climate change, was a crowd favorite, and received a standing ovation as he took the stage. “We are trying to open up the television medium so that viewers can help to make television and join the conversation of democracy and reclaim American democracy by talking about the choices we have to make,” said Gore. " Excerpt from Emmy's Website.